Welcome to the new Ewell Sessions website. 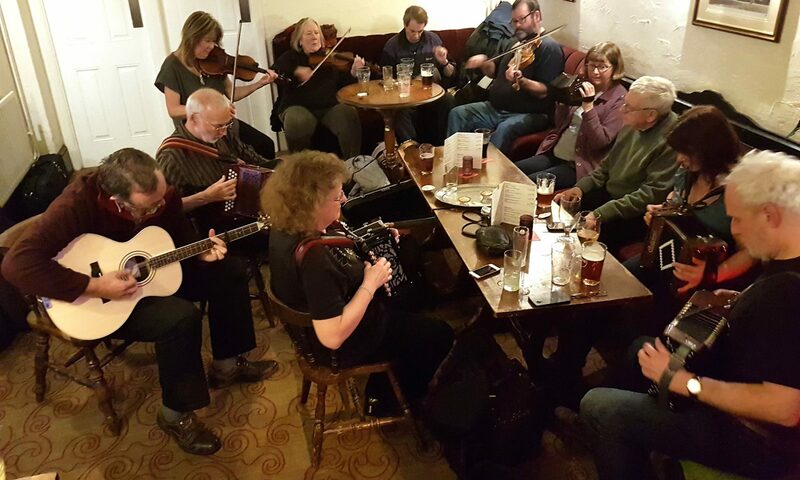 We have two monthly folk sessions here in the village, one for steady-speeders (beginner/intermediate players) and one designed for more experienced players – both sessions are friendly and accessible and welcoming to all. The tunes we play are generally in D, G and Em and are mainly traditional tunes, we welcome players of all acoustic instruments (no amplification, please). Our sessions are held in two of the village pubs, The Wheatsheaf and The Famous Green Man – thanks to Darren at the Wheaty and John at the Green Man for hosting us. You’ll find a lot of the same faces at both sessions, and the session season runs from September to June – we take a break in July and August for holidays and festivals. In addition to our folk sessions the village has a Cotswold morris team, Ewell St. Mary’s Morris Men, a North West morris team, Phoenix Clog and a new sword dance team – Green Man Sword. If you are interested in watching, dancing or playing for any of the village teams check out our Ewell dance page to get in touch.